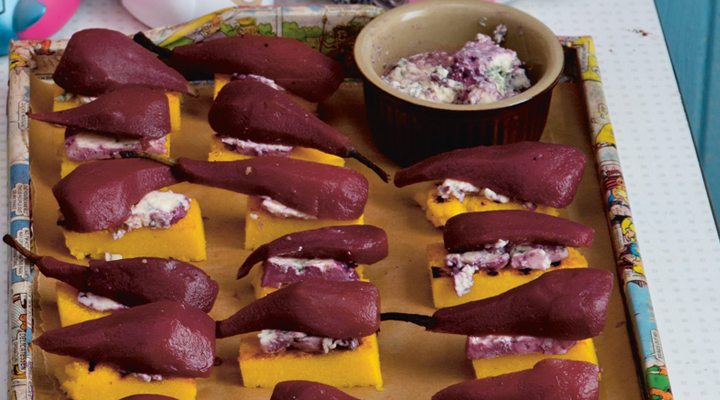 Swap out the Rossini Blue Cheese with Cambozola for a milder blue cheese flavour. 1. Cut the vanilla pod in half lengthwise and scrape out all the seeds with a small knife. Place the seeds and the pod in a large pot set over a medium heat with all the other ingredients except the pears and stir together to dissolve the sugar. 2. Peel the pears, keeping the stem on, and place them in the pot. Simmer, covered, for 20 to 30 minutes, until the pears are tender when you pierce them with a skewer. 3. Once the pears are ready, scoop them out of the pot with a slotted spoon and set aside. Bring the poaching liquid to the boil and reduce by half, stirring occasionally. While the liquid is reducing, cut the pears into quarters and allow to cool, then place in the fridge to chill. 4. Cook the polenta by bringing the stock to the boil in a large pan. Gradually add the polenta in a thin stream, whisking continuously. Reduce the heat to medium and stir with a wooden spoon until the polenta is very thick, about 5 minutes. Remove from the heat, stir in the Parmesan and season well with salt and pepper. 5. Using a palette knife, spread the polenta onto an oiled baking tray to a thickness of about 2cm. When it’s firm and cool to the touch, slice the polenta into 2cm x 5cm fingers and brush with olive oil. Cook the polenta crostini in a griddle pan set over a medium heat for 2 minutes on each side to crisp up. 6. To assemble, place a teaspoon of crumbled blue cheese on each crostini and top with a quartered pear. Once the stock has become syrupy, strain it through a fine-mesh sieve and drizzle it over the crostini.